La Familia believes that a strong community leads to better outcomes for everyone. That’s why we’re committed to providing community-building events that make us healthier, happier and more connected. Many of our programs and services are available to all community members. Take a look at our ongoing programs below and contact us for more information on how you can get involved. Karate Community youth. Tuesdays and Thursdays, 6 – 8 p.m. held in the La Familia Gymnasium. 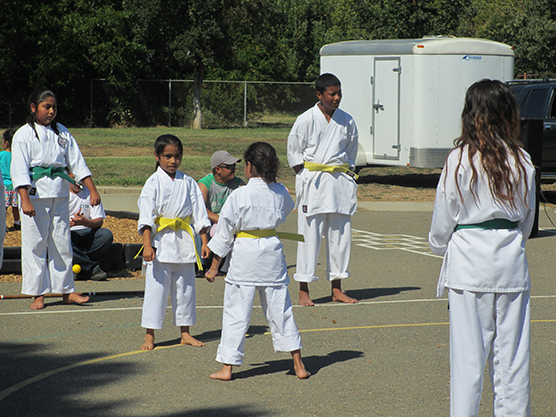 Free karate classes—participants pay $25 annually for accident insurance and for the purchase of a uniform. Annual Health & Safety Fair All community members. La Familia’s annual Health & Safety Fair is held in partnership with other private and public agencies each year. Participants receive free health related screenings, resources and information, activities for families and their children, healthy snacks and raffles prizes, and assistance with Medi-Cal applications. Check the events calendar for date, time and location. Create-a-Costume for Halloween Party All community members. Contact La Familia for more information. Adopt-a-Child (Winter Holiday) All community members. Held annually; contact La Familia for more information. La Posada Holiday Celebration All community members. Held annually; contact La Familia for more information.